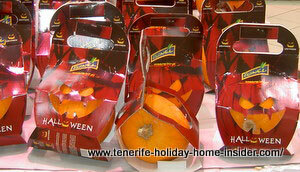 What's normal with the Hypermarkets Alcampo Tenerife and what's not? 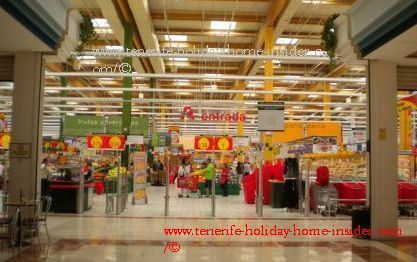 The Hypermarkets Alcampo Tenerife belong to the biggest on the island. It's quite amazing that Alcampo 'hypers' as well as the shops in petrol service stations by that name which are subsidiaries of the French Auchan chain could establish themselves so well and fast in Tenerife. Mind Auchan only really started expanding in 1981. By the way, the megamarket Alcampo La Laguna has been downsized from 74 cash tills to less than 64 while some allow for self service check-out without human cashiers. Rare dog friendly underground parking Alcampo La Laguna. The inside parking of Alcampo La Laguna doesn't only have shade. It also provides natural ventilation, as the park house is well aired and open from two sides. All that's needed to keep your pets safe and happy on a hot day inside your stationed vehicle are slightly open windows. Only one of three mottoes may be seen as normal. Only two Hypermarkets Alcampo Tenerife and both on the same freeway. on the TF 5 freeway exit 36, 38312 La Orotava, Tenerife North. The opening hours are much like those of other supermarkets on the biggest Canary Island, except for Mercadona Martianez that's even open on a Sunday. Lets look at la Orotava Alcampo hyperstore of about 7500m2 of extraordinary large space. It's pretty much like the one in San Christobal de la Laguna. The Alcampo of La Villa Orotava is also very easy to reach for those with wheelchairs or with mobility problems. Why? There is ample space of free parking on a top floor one can drive onto to reach the shop on foot fast in a 100% flat mall. This is similar at La Laguna, if I remember correctly. Cigarettes and a gigantic offer of beers, wines and other liquors. A huge amount of varied vegetables and fruit can fill your shopping cart fast after you’ve weighed them. There are pre-packed salads, mushrooms and some vegetables in a chiller department as well. Some salads are marked as organic which isn't very common. What's missing at the Megastores of Alcampo Orotava and La Laguna? The bakery, dairy and cold meat departments flank the green grocer section. Contrary to all this is the back end of the store where you find all large items for home, garden, cars, school work, art and crafts as well as office stationary. The middle section comprises the departments for fresh meats and seafood. Then there is also frozen, bottled and tinned food. There is an impressive selection of beer, wine and liquors. Cereals, basic foods, coffees and teas are followed by the household cleaners, hygiene and cosmetics section but no pharmaceuticals. Clothes, shoes, tools, fill some lanes on their own. Actually, nothing comes to my mind that Alcampo doesn't sell. It may run out of an item, such as an adhesive lint wiper which is used by dry cleaners, but will never take long to have it back in stock. Alcampo has customer service for Smartphones, Tablets and Computers and there is always a special offer. It also has desks where you may return goods or may hand in reclamations. However, expect better assistance with your cellular telephone on a day and at a time when less people are in the store, such as on a Monday. Anyway, the same problem may arise at the Vodaphone provider opposite the Alcampo shop when too many people want attendance. What do the Tenerife Hyperstores of French origin not have compared to two Spanish stores? Alcampo doesn't have as many employees to ask questions in its many lanes, as is regular at the supermarket chain Mercadona. However, the French Hyper Bazar has a few young people on roller skates to speed up help for special requirements. Also, there doesn’t seem to be any facility to assist the holiday home in Tenerife owner or renter who doesn't speak much Spanish, as is possible at Mercadona as well as at the Santa Cruz Corte Inglés. Unfortunately, I don't know who helps with repairs with the Alcampo stores in San Christobal de la Laguna. Go there or call them on the telephone to find out. An excellent contract workshop at Cruz Santa renders after sales support for the Orotava area. But you will only be given the name and the Telephone number. 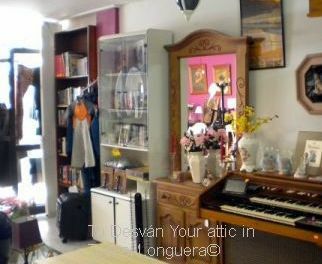 This agent delivers spare parts and does repairs to household appliances of Alcampo. This may be needed when a product guaranty has lapsed. There certainly are others that assist with other goods by the French hyperstore. The hypermarkets organize reality shows for shoppers, such as talent shows, raffles, fashion walks for want to be models, you name it. Watch out for advertisements near the entrances of the shopping centers at high traffic times, such as around Christmas. Mind it ends only some time after Reyes of January 06. Interesting information in English about the Alcampo online shopping procedure where no minimum or maximum purchase applies. Wouldn't that strike you also as very interesting, as it's certainly not normal. The hypermarkets Alcampo Tenerife as well as their little cousins of petrol station supermarkets support a campaign to save endangered sea animals. Therefore, it stopped selling red tuna as well as any fauna from the ocean that is in danger of extinction. From Hypermarkets Alcampo Tenerife back to shopping in Tenerife.